You're building your deck around this or you're not playing it. That's all there is to it. You just don't play this card in any deck except the Melek, Izzet Paragon deck-- the one you built for the specific purpose of playing Melek, Izzet Paragon. So it's not a question of whether Melek is a good card, it's a question of whether the Melek deck is a good deck. And that's a dicier question, because there's different ways to build it. You'd need counterspells, to protect the removal that your opponent will inevitably aim at Melek when he figures out you built the deck around it. Card draw, counter-intutively, is not a major issue, as you'll always have another card on top of your library, but finding and casting Melek in a timely fashion is crucial. Red brings burn and artifact kill to the table, but enchantments still give the deck fits. Most deckbuilders' knee-jerk reaction will be to make the deck primarily blue, for card draw and countermagic. But a free Twincast on any eligible spell is a much greater benefit to red burn, which can now generate card advantage and take out opponents twice as fast. The more one looks at it, the more this starts to look like the Pyromancer Ascension deck from Zendikar block, a deck which lots of Johnnies tinkered with but nobody was able to truly crack. Melek's only real contribution is not requiring quest counters, and making the deck viable in Commander (where Pyromancer Ascension doesn't work at all due to the need for multiple copies of cards). I have no doubt people will build this deck, but I doubt it'll be a winning strategy. I sort of had a head start on some of you when it comes to Melek here; I saw an article about him on Wizards of the Coast's website last week. Apparently he's the guy for whom "born to X" (where X in this case is "run the Implicit Maze") applies literally. I never even knew there was such a guy until now. Gameplay-wise, Melek would be good if he were just an updated version of Magus of the Future or if he were just a way to double up on powerful instants and sorceries. The fact that he does both puts him above the category of good. His mana cost and Standard's relatively small card pool mean that we probably won't be seeing too many competitive appearances from him in that arena, but Commander is going to be all over this guy. He obviously shines as the centerpiece of a deck, but he can also support a commander like Riku of Two Reflections or almost any strategy that has a significant number of instants or sorceries. Welcome back readers todays card of the day is Melek the legendary maze runner for the izzet. In standard six mana and nothing to immediately show for it is sort of a downside, the ability to cast spells from your library can be a boon in a heavy spell based deck but I don’t see this card making a huge splash in tournaments. Especially outside of standard where it is an expensive and highly reliant on deck construction to make an impact. In casual and multiplayer the obvious applications for commander are there as well as being able to just stack your deck with good stuff spells and then immiedetly copy them. It requires some thinking when constructing your deck or liberal use of deck manipulation and this card could find a niche. In limited its kind of expensive and less likely you can stuff your deck with good spells making it more of a poor choice. Overall a powerful card for casual and multiplayer especially the area of commander. Today's card of the day is Melek, Izzet Paragon which is a six mana Blue and Red 2/4 Legendary that has you play with the top card of your library revealed, the ability to cast it if it is an instant or sorcery, and whenever you cast an instant or sorcery from your library you may copy it. 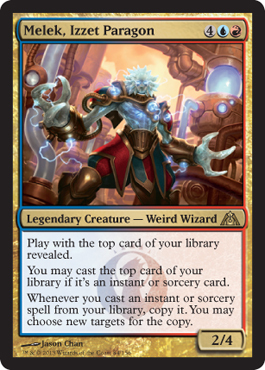 In an Izzet style library manipulation deck this has the potential to be a major component or additional support as a source of doubling your spells and may gain traction in Red/White/Blue as well. The deck is best off when built around the concept, including library manipulation, and will probably see some play across formats at least while this block is in rotation. In Limited this can be a huge benefit or dead weight depending on the pool of spells available to you. A six mana 2/4 with no combat abilities is a bit underpowered in the format and blocking or attacking with it adds multiple removal concerns that can overcome the otherwise moderate protection of four toughness. The possibility of doubling removal, direct burn, draw spells, or other in color choices makes this very tempting and even getting one use of the effect per play can often justify the inclusion. For that it is a playable first pick in Booster and inclusion in Sealed which is aided by only having one of each color in the casting cost, allowing flexibility in splashing and spells from other colors. Welcome back to the Pojo.com card of the day section. We are looking at previews for the new set Dragon's Maze this week. Today's card is Melek, Izzet Paragon. Melek is a rare legendary creature weird wizard that costs four generic, one red, and one blue mana for a 2/4. Melek says you play with the top card of your library revealed. If the top card of your library is an instant or sorcery, you may cast it. And whenever you cast an instant or sorcery from your library, you may copy it and choose new targets for the copies. Melek is amazing, except for six mana in non-ramping colors. But get past that and he is simply amazing! With some of the potent spells that exist, even in Standard play, spending six mana for this guy is worth it. Think of the possibilities with the Charms. Now they are doubled! Searing Spears, Shocks, all of them gain extra value for this guy being a presence. A really solid card that I hope will see serious play, and not just be a Commander card.